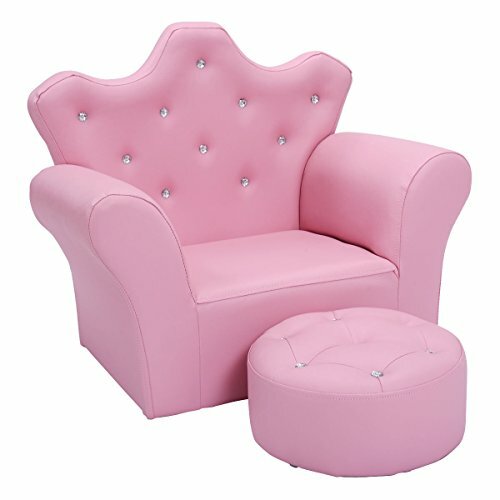 Description: This Lovely Princess sofa set will make all dreams come true at any girls room. It is upholstered with sponge to add comfort and durability. It will be an attractive and appealing spot to let your little girls spend more leisure time on their own furniture to sit, read stories, watch movies, eat snacks, play or just relax. It is an ultimate space-saving and light-weighted sofa. This cozy kids sofa will be a great addition to their play room, bedroom, living room, day care, sleepovers at grandma and grandpa's, vacations, or nap time. PREMIUM QUALITY - Constructed by sturdy wooden frame, covered by PU surface, filled with soft sponge, this upholstered sofa with ottoman is extraordinarily stable and durable for a long period time to accompany your kids. It is an ultimate space-saving and light-weighted sofa. This cozy kids sofa will be a great addition to their play room, bedroom, living room, day care, sleepovers at grandma and grandpa's, vacations, or nap time. Not only is it comfortable, but durable, and easy to clean. Wipe clean with mild soap and water. Dimension: Please refer to the picture, Weight: 15 lbs, Weight Capacity: 110 lbs, Suitable at ages from 1-5 years old.